Protect doors from foot and impact damage with Metal Kick Plates. Durable metal kick plates are available in either 0.050" thick stainless steel or 0.050" thick brass. Koffler has 7 different great looking, finish options. Kick Plates also come in three different mounting types to accommodate door construction material. When choosing a kick plate, please select a plate that is 2" shorter than the nominal size of the door, to ensure proper fit. Kick Plate Sizes: 6" x 28", 6" x 30", 6" x 34", 6" x 40", 8" x 28", 8" x 30", 8" x 34", 8" x 40"
Sizes: 6" x 28", 6" x 30", 6" x 34", 6" x 40", 8" x 28", 8" x 30", 8" x 34", 8" x 40"
Antique Brass has a satin, or dull brass, blackened (antique) finish on brass, gloss lacquered. Protect doors from foot and impact damage with Metal Kick Plates. Durable metal kick plates are available in either 0.050" thick stainless steel or 0.050" thick brass. Koffler has 7 different great looking, finish options. Kick Plates also come in three different mounting types to accommodate door construction material. 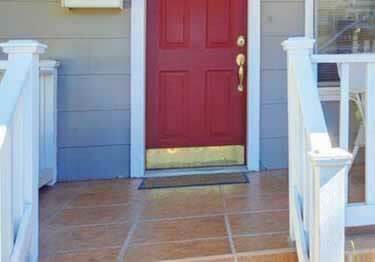 Protect the bottom of doors from heavy foot traffic while providing them with a decorative accent. Our Diamond Plate Kick Plates are a great solution to protect doors while presenting a contemporary rugged look. Heavy duty Stainless Steel & Rigid Vinyl (60 colors) push plates for perfect door protection, easy to clean, decorative finish.